I recently took delivery of a set of linen shirts from D'Avino in Naples (it's been a good quarter...) and I thought the colour selection I ended up with was interesting. I'm increasingly moving away from the more corporate colours of white and light blue, in favour of more interesting tones such as these. It's a relatively easy way to add interest to a navy jacket or grey suit, and a subtler one than windowpane checks or bright handkerchiefs as well. The dark blue, indigo-like colour won't surprise many people, as I've worn similar colours in cotton before. It goes well under casual navy jackets and with mid-greys. And on a sunny day, is particularly nice with cream trousers. There is a suggestion of a denim shirt - if in a relatively raw state - which helps it appear a touch rugged too. The green shirt, lovely as it is, I have found extremely hard to wear. I was inspired by shots from Luca Faloni's campaigns, showing a rather good-looking guy wearing the same colour with white trousers in the full glare of Italian sunlight. Unfortunately, it turns out that's pretty much the only time it can be worn. Certainly, it is best with cream trousers or denim - perhaps navy chinos at the outside. The oatmeal colour, on the other hand, is extremely wearable. It’s also a great, casual alternative to white or blue. Just don’t wear it with tan or anything remotely oatmeal in colour itself. I think it’s worth taking this opportunity to highlight the fineness of the handwork in D’Avino shirts. D’Avino is the most expensive of the three shirtmakers I normally recommend (Simone Abbarchi and Luca Avitabile being the other two) and has by far the most hand stitching – both functional and aesthetic. 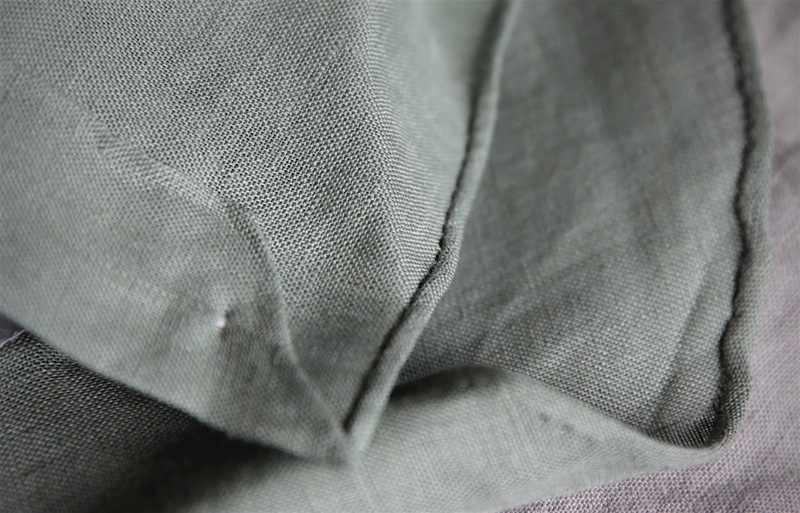 Above you can see the hand-rolled bottom hem of the shirt, which is perhaps the most impressive point as it is the most time-consuming. (Also arguably the most pointless since no one will ever see it. Above you can see the gusset at the side of the shirt - and running upwards from it, the side seam, which is also sewn by hand (though also reinforced by machine). Below, meanwhile, is the shirt cuff, where the sleeve has been gathered in gradually by hand all the way round. That careful gathering of fullness is what controls the distinctive ripples of a Neapolitan shirt at the top of the shoulder (below). Although most shirts from Naples have this touch, D'Avino exaggerates it slightly, which gives extra definition to the end of the shoulder. Finally, below, you can see the back part of the sleeve (running towards the bottom right) and the shoulder seam (running towards the left). Both with the tell-tale pick marks of the hand stitching. We've discussed before the benefits of different aspects of this handwork, but it's hard to deny the beauty of it - and it's nice to be reminded of how it turns an otherwise functional garment into one of real beauty. D'Avino shirts start at €350 and the first batch has a minimum of three. Fiorenzo is not in London that often, but will be back in September. More details closer to the time. He also has a new email address for those wanting to get in touch: info@davinonapoli.com. The linens, by the way, were sourced by a friend from non-bespoke stock. But there are similar colours in the Albini and Canclini bunches. You can follow the discussion on D’Avino linen shirts – in denim, oatmeal and green by entering your email address in the box below. You will then receive an email every time a new comment is added. These will also contain a link to a page where you can stop the alerts, and remove all of your related data from the site. These, especially the oatmeal, look lovely. They are, however, at €350 incredibly expensive. It would be incredibly useful if you could write a piece broadly covering RTW, MTM, Bespoke and “High end” bespoke for Suits, shirts & shoes and the marginal benefit / utility of these. For a plebeian like myself only a man with £10’s of millions in the bank can justify multiple (let alone 1!) shirts at such a cost. Clearly you disagree, and obviously this is part of your living / career at this point. Still I’m sure the readers would be interested in such an article…. The other thing I would be interested in (however I appreciate the difficulty) is the background of those that use these tailors! I would guess that Graham Browne is posh city boys, and Cifonelli is Euro millionaires but it would be good to have some insight! I have to agree on the point regarding prices. 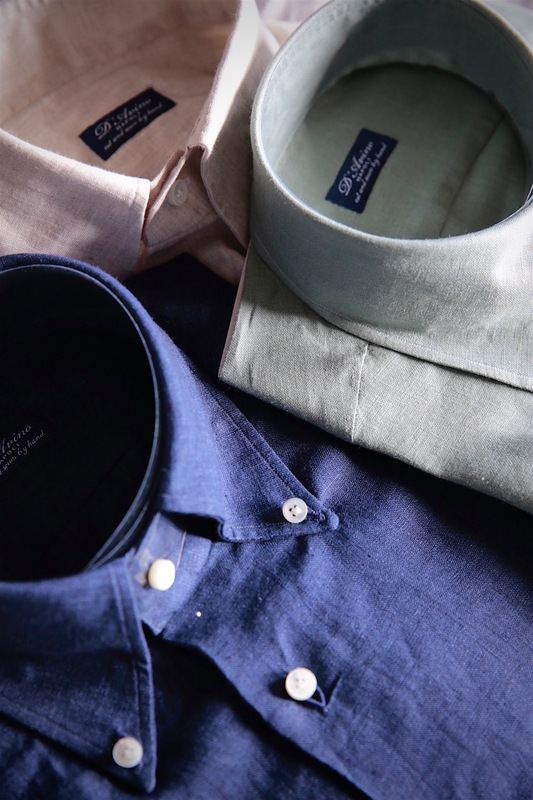 Unless you have a real problem getting stuff to fit (and we’re talking about a pretty casual shirt) why wouldn’t you get some of Luca’s Portofino linen at less than half the price? Shirts like this are not going to stay in your wardrobe for more than 4 seasons, so why spend the money? Good point made by ‘Anonymous’. Would be good to always put a proviso of whose best at what price point. Reference “Graham Browne is posh city boys, and Cifonelli is Euro millionaires ” …… any truth to this , Simon? I have had good results with Luxire, a MTM shirt company. I used measurements from a shirt that fits me very well. Price is good and the fabric selection is very large. An the customer service has been very good. The website is poor with no real ability to search for something specific so it requires a lot of scrolling through pages to find what you want. But for men or more limited means it is a good option. It is all a matter of priorities. I have a normal IT job and nevertheless wear only bespoke. And in a matter of fact bespoke clothes are not really that much more expensive then they used to be 100 years ago. The difference is that 100 years ago people had a small wardrobe and often bought a suit in monthly installments. Put 100 EUR per Month aside and here you have a bespoke suit once per 3 years. With 200 EUR per Month you could get any Savile Row bespoke tailor. It is all in our mental perception on how much should stuff cost. We are simply used to the cheap made in Bangladesh stuff in the RTW shops and that is why we take for normal that a shirt should cost 50 EUR (or 20 on sale) and not 350. The reference value creates the perception and not the intrinsic value of the object. There were times where people had to save money for a long time to buy a fridge or a TV or a washing machine. Now a middle class west european could afford to buy such machine of average class without much stress. P.S. @Simon – currently I am predominantly mixing oatmeals and tans 🙂 I love the look. Regarding fit, it feels to me that if you’re going to wear them untucked like the guy in the Luca Faloni pictures, the shirts shouldn’t be fitted too close to the body with darts and so on. Do you concur? If so, what do the shirts you had made look like as far as fit is concerned? I have another question. How do you feel about pink as a shirt color? I wear mine tucked in, so the fit is the same as a regular shirt, but yes I agree if they are untucked. Shirts look beautiful. Look forward yo him coming to London. Interestingly I bought a similar shade of shirt and found the same thing. Looked great with cream trousers in Rome but here in Britain…..it didn’t. Small point, but denim is a fabric, not a color. Move over Jay Gatsby! They look beautifully crafted. Here’s to more good quarters. Simply beautiful. I love the green shirt – and I looked the Luca Faloni photo – such a great look – that it almost needs its own shirt . Does D’Avino ever come to the States? I looked at the trunk show tab and did not see anything. 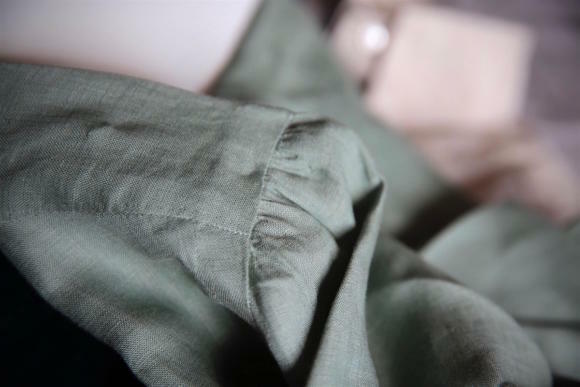 The problem with green is that it is a “muddy” colour and therefore can’t work in a lightweight cloth. Try it with dark blue legs and a super bright colour on top; canary yellow, cream etc sweater over your shoulders. Was talking about the shirt….. The green is lovely but I can see how it would be hard to wear. I wonder how it would work with brown trousers or maybe even your corduroy, brown cotton or tobacco linen suits. Is that €350 including VAT? Interesting that you say not to wear the oatmeal with tan or similar colors, in that I’m wondering what you think of an intentionally low-contrast look with all lighter colors? Obviously difference in tone and texture. Simon, does this mean you cooled to your all grey outfit that you showed us on PS a few years back? Lovely read, as always. In keeping with Anonymous’ post, have you consider d doing an in depth guide for shorting? I loved your recent post on shorting mills but I am certain that, like myself, many find the shirting weaves and numbers confusing i.e. : 140/2*70, 80/2*60/1, 120/2*60, etc.. I think the menswear world has benefited greatly from the clear understanding of Super #’s and explanation of microns. Perhaps it’s time to discuss shirtings in your Guide to Cloth? Would you wear such shirts in winter? What I’m trying to get at, I guess, is are not linen shirts intrinsically casual and summery? More casual and more summery than normal cottons, yes, but they can be used in other ways and at other times. 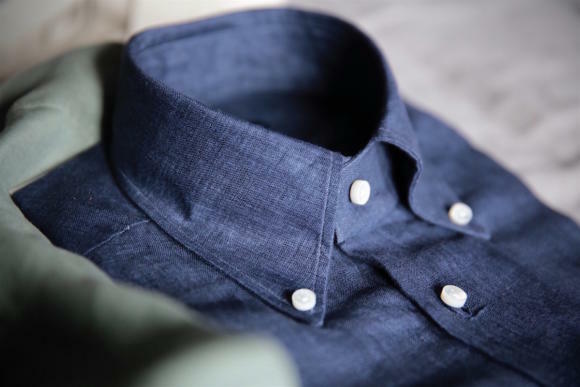 I have wanted to try a linen shirt for a while and had my eye on a few from Luca faloni but do you ever find enough occasions to justify wearing them in Britain. Yes we get a few hot days but not that hot, and my office is a permanent 19degrees thanks to air conditioning. I was thinking could you get away with under knitwear, cardigan – maybe a crew in the autumn or would the fabric contrast not work so well? Maybe knitwear combinations will be the place where your green shirt shines. Simon, does the cloth determine your choice of collar (except for the OCBD)? 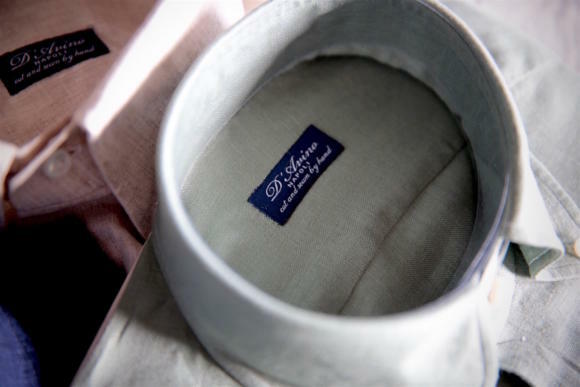 And how similar are your collars from the three shirtmakers you use? But I assume you would not have a linen shirt made with a fused cutaway collar? Being a more casual shirt, surely you’d go with a soft button-down? Fusing a collar is like having corrected grain shoes. An infused collar is a traditional feature of bespoke shirtmaking, requiring skill and time. Fusing was developed as a result of mass production and even though quality has improved since its inception, it is still wholly inferior as a finish. Sorry to have to call you out on this but your readers deserve to know. Thank you. I am aware of all of the history and the developments of the styles. How it was developed or how much time it takes is irrelevant. The only thing that matters is the functionality and style created, and on all counts I prefer fusing. I very much like wearing darker shirts, in more casual cloths. However, it can be hard to match them with a tie. What sort of ties would you recommend with such shirts? Or do you think it better to go tieless? 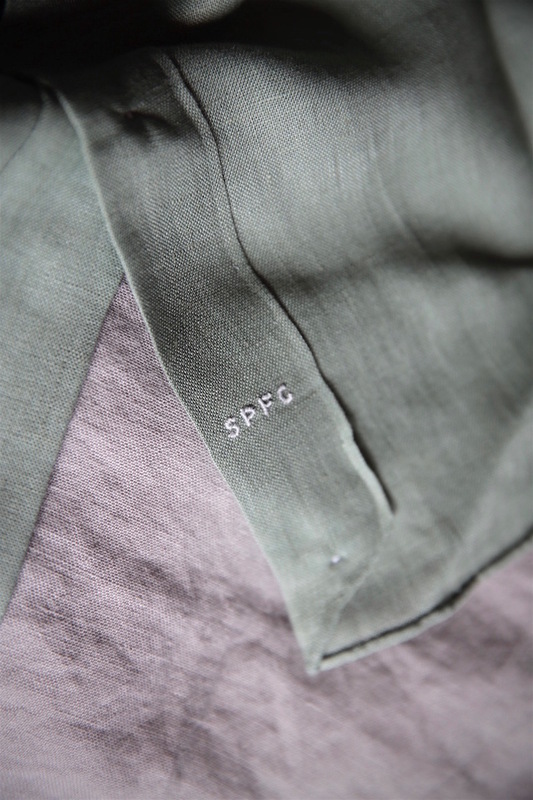 How very timely as I am contemplating a sage or olive green linen shirt so your comment on finding it difficult to wear is particularly interesting. Is it the particular shade that is the problem or pairing it with slightly more formal clothing? Having read your previous posts referencing olive shades in trousers you don’t seem to have had the same problem pairing those up – is there a difference in the fact that it is a shirt as opposed to trousers? Simon, I love you, but commissioning a green linen shirt with tons of handwork may be a bit much. I don’t think I’d ever get bored of wearing D’Avino shirts in “corporate” colors. Although I salute your move away from corporate – something I did eight years ago – I’m not sure these linen shirts are the way to go. They are incredibly expensive and it doesn’t surprise me that you are finding it difficult to wear. On a more general point, given the amount of ‘stuff’ you must have accumulated, have you thought about finding a couple of homeless men of about your size that you can gift the items you no longer wear to ? It would make for a great blog feature if you followed their use and enjoyment of the products whilst observing how they stood up to real life. Who knows, you might even change somebody’s prospects. Thanks David, and an interesting point. I do give things away to friends and family sometimes, but I was also involved at one point with a service that worked with homeless people helping them to get jobs – including supplying clothes. I think it would make a marvelous adjunct to your blog and give it a genuine philonthropic edge that would deflect any accusations of ‘over consumerism’. The clothes would have a life beyond you and would help people restore their dignity, help with career prospects etc.. I was involved with such a charity when I lived in NYC and it did amazing work. Difficult to manage but the good things in life often are. Excuse my frankness, but this sounds to my ears more like a pretentious PR stunt, than a genuine attempt at restoring the homeless to dignity. Which I would dare to venture is not consistent with Simon’s character, considering the amount of emphasis he placed on being ‘genuine and truthful’ on the PS journey. And my opinion has always been, that clothes alone never make the man. Suited and Booted? Might be nice to have a short post on them for information to readers. Beautiful shirts, and I particularly like the blue. That is quite a lot of gathering on both the sleeve and the shoulder. I’d be interested to see what it looks like on you. My concern with wearing it would be that it looks too feminine. What do you think? I won’t say it cannot be done, but most men are likely to fall down on the details, and make it look to fussy. Overall, I would say these shirts look best to worn casually..and they do look good.. I like my linen shirt (from Luca Faloni … just great) but my wife doesn’t …. because ironing is just a nightmare! I am glad you like our shirts. 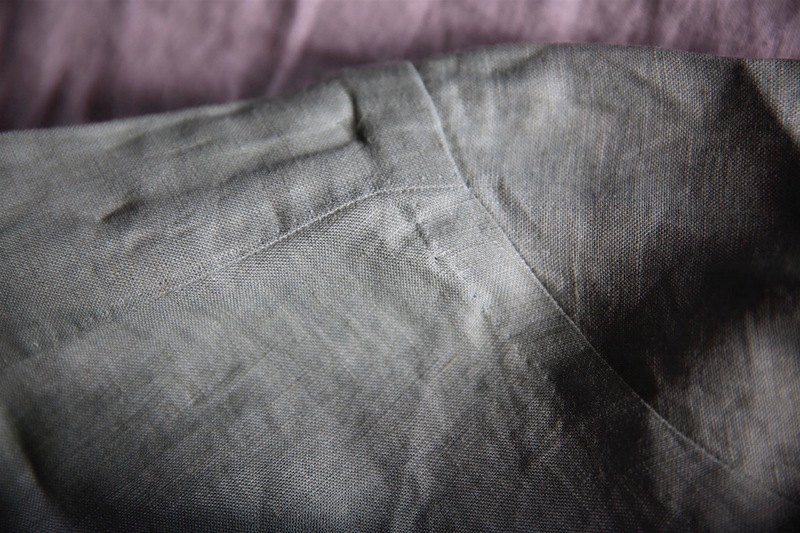 A tip for ironing linen is to use high temperature and, most importantly, almost continuously press the steam button. You should also spray a little bit of water in each area before ironing. That should make the process much easier and faster. Lovely shirts and a great way to add interest to the summer wardrobe. Shame about the issues with the green color (always beware the good-looking Italian man in the photoshoot!) Interestingly, I tried on a jacket in a similar color recently and it looked great, even with my pasty English complexion. It’s amazing how reversing the jacket and shirt colors can make such a difference. Do you think it would be better in a darker color, like a forest green, or even an olive green? Yes, a darker colour would be easier – essentially anything for which it is easier to create contrast, like the green in our Friday Polos for example. No, I haven’t tried shortening shirts, but interesting on the proportions. I did try that alteration to mixed results. I think it has to do with a less casual shirt being more closely fitted, as I pointed out in another comment above. The great thing about linen shirts is that they get better with age. I can see these with a grenadine tie and a cardigan, with khakis or jeans.. The great thing about linen shirts is that they get better with age; two of mine are almost twenty years old and still in great shape. I wear them with jeans or khakis ( I no longer wear neckties) and a cardigan if it’s chilly, but no doubt a grenadine tie would look great. Your three are lovely, but like a previous commenter, I question the excessive gathering at the cuff and shoulder. 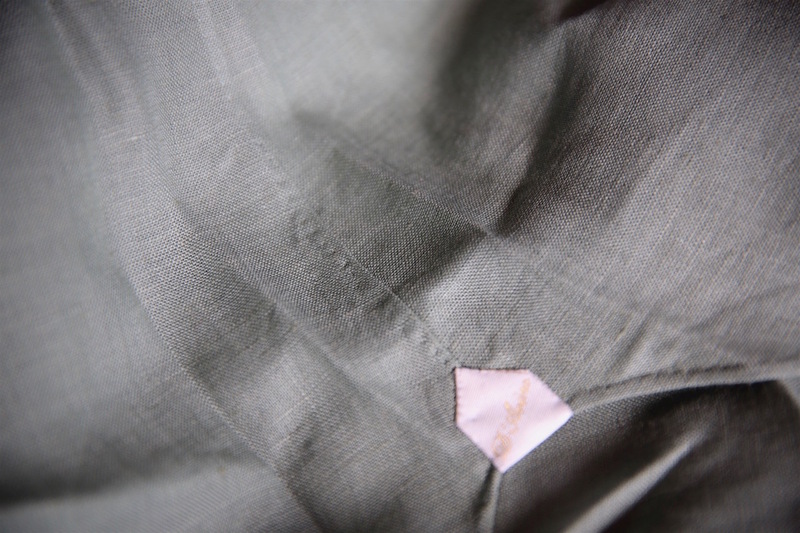 My first bespoke shirt had these details and I rarely wore it unless the cuffs were rolled up, attributing the detail to the fact that it was made by a dressmaker and not a ‘shirtmaker’. Linen is also a good choice for what we call ‘camp shirts’ here in the US– a square, hip-length shirt like a Hawaiian, short sleeved, very soft one-piece collar and sometimes with a pocket. They’re great on super hot days; there’s also a cold-weather version, usually in wool with long sleeves. However, as longtime reader of PS, I’d say they’re not for you. Could you give us some details on the jacket your wearing whilst standing next to Luca in today’s instagram post? You are wrong on quality of making in high street. I was heading company making for British, and all had very not same of standard so all different. Some very high quality, some cheapest possible not including the fabric choice. So not all the same like you say. I can give you names of good British if you like and the rubbish ones to help your blog, but you are wrong if you say all are same. What’s PF for in SPFC? Nice subtle way and place to add a monogram. How long do they take to make a muslin fitting? Can they do same day? I’m in Naples on a Saturday in mid-July and thought I’d stop by if it is possible. 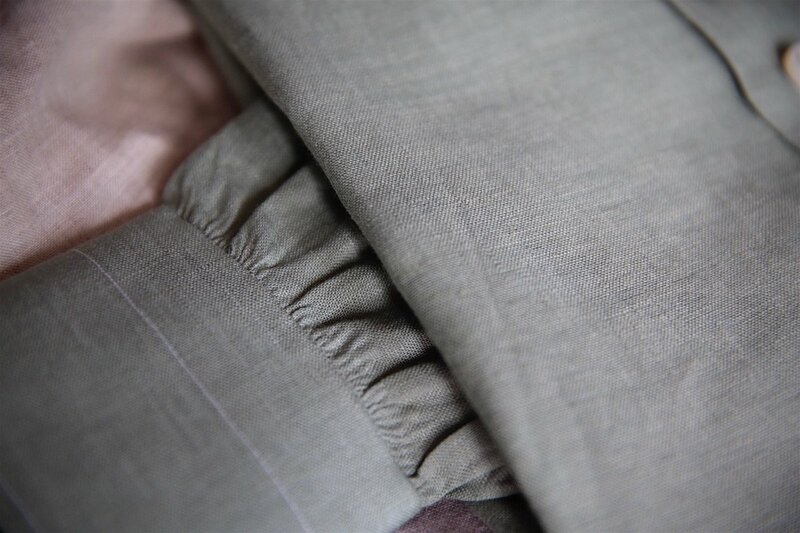 For me what´s most difficult to decide in bespoke shirtmaking is the tightness of the armholes. One has to compromise between form and comfort, of course, and that seam should not be felt when standing or sitting upright, but how much pressure is tolerable when one bends down to tie his shoelaces, for example? I would be very grateful for your opinion. To be honest, I would say not very much. I don’t think you should notice them at all, pretty much, once the shirt has softened up. The functional benefit of that small reduction in circumference is not very much. Simon – interesting article. I had a shirt in similar green – it didn’t really work with blues, greys or brown etc. – too pale and I therefore gave it away. Ultimately it may belong to a colour palette of another age (late 40s sage green, peach, coral etc.). Its worth having a look at retro/historic colour palettes. A notch up to olive green and suddenly it all worked. The other shade of green that’s hard to mach is bottle green (I feel an article suggestion coming on….). We forget the tones and colours of old but it is useful to contrast our modern palettes to these as it gives a greater understanding of why some colours work and some don’t. For Axel; try washing the linen shirts with a small amount of starch – it will help with the ironing though may crease more in the wear. Alternatively, and a better method, is to iron whilst still damp. Best of all is to own a good steam generator iron (Rowenta, Bosch, Laura Star etc.). 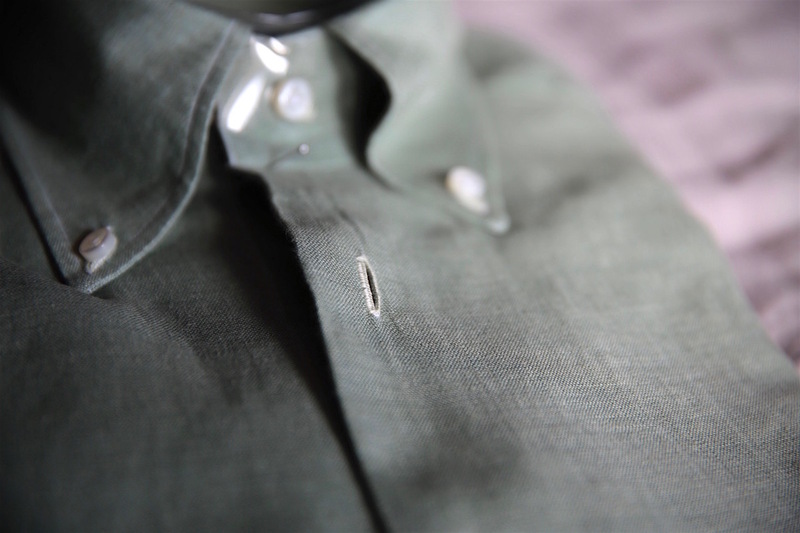 Have you tried Luca Faloni’s linen shirts? Do you know if the “slim” is very slim? Or, the other way around, whether the “regular” fits very baggy? Thanks Simon. How would you rate the quality? Particularly the quality of the linen? I tried a few regular fit. I did really like the quality and fabric but were just far too slim for me. Even the regular fits have curved seams more akin to a traditional slim fit. A slightly off topic question but would value your input. Do you have any experience with linen knitwear, i.e. jumpers? Because of linen’s weight when knitted, i am concerned whether linen jumpers retain their shape. What’s your recent acquisitions and advice for shirting colours and fabrics been like for multi purpose shirts which don’t look out of the place in office or weekend. I am going shortly to make the fitting with D’avino. What three colors would you recommend, besides blue, for a casual look with jeans and chinos? By the way, I haven’t seen any photo of you wearing shirts with stripes or patterns. Is there any reason for that? I tend not to wear striped or patterned shirts, no. Largely because I tend to prefer pattern in my jackets or ties, and while this doesn’t preclude pattern in the shirt, it is harder to wear. Simon may I ask what is the collar length of your linen shirts here? Isn´t the everyday collar longer than that? hey simon do you often wear shirts with darts? Also how much allowance in the waist do you have for your shirts?